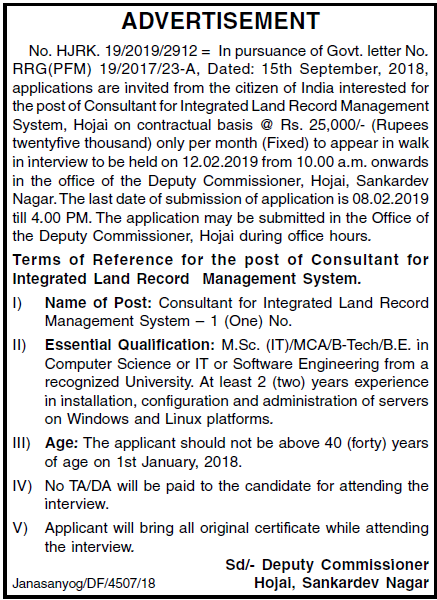 Applications are invited from the citizen of India interested for the post of Consultant for Integrated Land Record Management System, Hojai on contractual basis Rs. 25,000/- (Rupees twenty five thousand) only per month (Fixed) to appear in walk in interview to be held on 12.02.2019 from 10.00 a.m. onwards in the office of the Deputy Commissioner, Hojai, Sankardev Nagar. Essential Qualification: M.Sc. (IT)/MCA/B-Tech/B.E. in Computer Science or IT or Software Engineering from a recognized University. At least 2 (two) years experience in installation, configuration and administration of servers on Windows and Linux platforms. Age: The applicant should not be above 40 (forty) years of age on 1st January, 2018. How to apply: The last date of submission of application is 08.02.2019 till 4.00 PM. The application may be submitted in the Office of the Deputy Commissioner, Hojai during office hours. Applicant will bring all original certificate while attending the interview. No TA/DA will be paid to the candidate for attending the interview. Venue: Office of the Deputy Commissioner, Hojai, Sankardev Nagar.